Mix together praliné, sesame paste and caramelised sesames. Melt together chocolate and cocoa butter at 45°C. Mix together both mixtures and temper at 23°C. Pour in moulds and leave to crystallise at 4°C for 10 minutes. Mix together Fruit'Purée Yuzu Capfruit, Fruit'Purée Pear Williams Capfruit and a bit of sugar at 40°C. Incorporate glucose, pectin and the rest of the sugar, and heat up to 72° Brix. Spread out on a frame between two rulers of 6 or 8 mm, and leave to cool. Mix Fruit'Purée Yuzu Capfruit, glucose and salt, and heat up to just below 30°C. Add butter to chocolate and emulsify. Mix together chocolate mixture and yuzu mixture. Add yuzu zest and pour into moulds at 30°C. Mix together glucose and starch. Heat soy up to 40°C and gradually add previous mixture. Emulsify with Turmix blender and store. 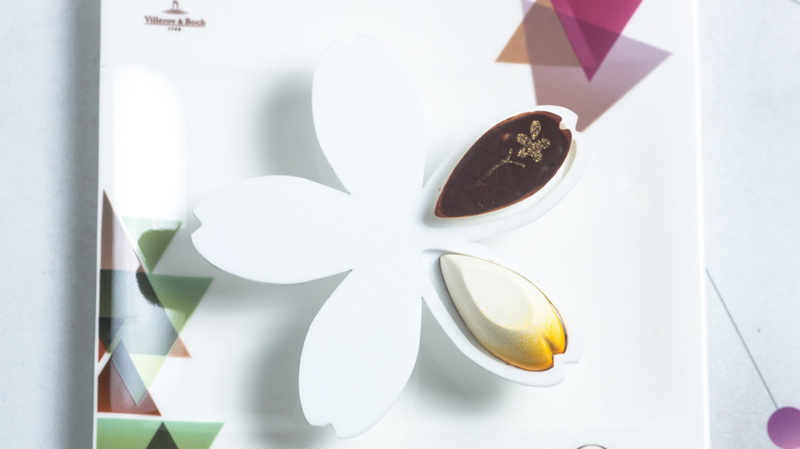 Spray moulds with coloured chocolate and create shells with Cacao Barry® milk chocolate couverture Alunga™ 41% cocoa. Fill moulds with textured soy, pâte de fruits and truffle, and seal with crunchy sesame praline.